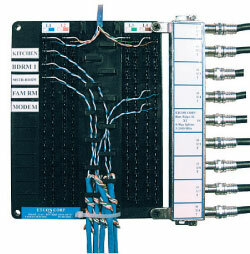 PHONE DISTRIBUTION DEVICE WITH 8-WAY 2050 MHZ (2GHZ) SPLITTER FOR RESIDENTIAL AND SOHO PHONE AND VIDEO INSTALLATIONS. Allows for up to 48 stations or phone home runs. 8-way 2050 MHz (2Ghz) splitter for CATV cable runs. DD1X1K DD1X1 WITH THE 110 PUSH DOWN TOOL. DD1X1CK DD1X1 WITH COVER and PUSH DOWN TOOL. DD1X1-N8 DD1X1 WITH 8 POSITION NETWORK CARD. X1C COVER FOR DD1X1 PHONE DISTRIBUTION DEVICE.